Write the digits from 1 to 9 into the fields. The description of a "word" gives the sum of all digits in this "word". In every "word" every digit may occur only once. Some numbers are replaced by alphabets. Same alphabets mean same number and different alphabets mean different numbers. Coded Kakuro is a classical Kakuro variation. It first appeared on Puzzler(*6) July 1990 Issue as contributed puzzle from reader. 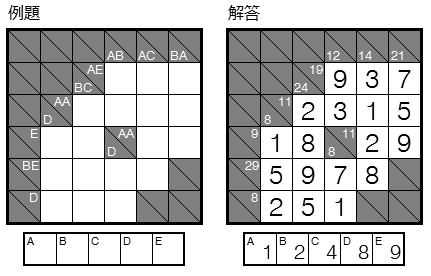 It may be oldest puzzle of coded variant. It also appeared in WPC(*2) and 24h PC(*3). There exist combination of Coded Kakuro and Coded Doors(*5). I think it is tiring to replace trivial alphabets in large puzzles. So some numbers are opened initially. 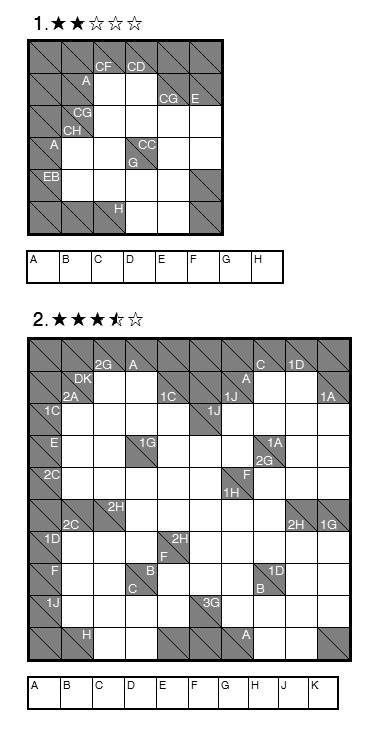 *6 Puzzler is a Japanese puzzle magazine published by Sekaibunka corp. There were much of classical and innovative logic puzzles on the magazine. Puzzler magazine has been publishied since 1983 and discontinued at 2000. Now it has been inherited to Nanpure fan, JPC, etc.